The Los Angeles Kings are 7-1 in the 2012 NHL playoffs and they are now a single win away from making the Western Conference Final for the first time since 1993. It’s been an impressive run for the eighth seeded Kings and when you look a little deeper, they have to be considered the favorites to win the West. When you look at all the teams that remain in the NHL playoffs, you can make a strong argument that the Kings have the toughest path to the conference finals. In the first round, the Kings faced the two-time defending Presidents’ trophy winning Vancouver Canucks. To say the Kings were the underdog heading into that series would be an understatement. Instead of being first round fodder for the Canucks as most hockey fans assumed, the Kings flattened the Canucks in five games while outscoring Vancouver 12-8 in the process. Perhaps the most impressive aspect of the Kings’ first round upset is the fact they won three games in Vancouver. The Canucks were a very respectable 27-10-4 on home ice this season, but they were unable to win a single home game in the playoffs against Los Angeles. On that note, the St. Louis Blues have had the exact same problem. St. Louis finished the 2011-12 season with the best home record in the NHL and the second seed in the Western Conference. It was a ridiculous 30-6-5 on home ice during the regular season. However, just as Vancouver before them, St. Louis lost the first two games of their series with the Kings on home ice and were outscored 8-3 in those two games. The Kings are currently a perfect 5-0 on the road this post-season. 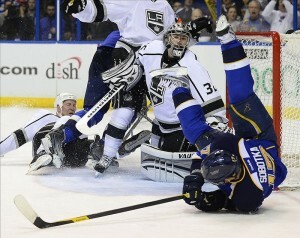 Throughout the regular season, the Kings struggled mightily to score goals. L.A finished 29th in goals per game and their power play was ranked 17th in the NHL; hardly anything to brag about. However, L.A was also dominant defensively throughout the regular season as they had the second-best goals against average in the NHL and the fourth-best penalty kill. Over the course of an 82-game schedule, the inability to score goals on a consistent basis will result in losing streaks. Here is a list of some of Los Angeles’ losing streaks during the 2011-12 season. • From October 25th to November 10th, the Kings lost 7 of 9. • From November 23rd to December 13th, the Kings lost 7 of 9. • From December 3rd to December 17th the Kings lost 6 of 7. • From February 3rd to February 27th the Kings lost 9 of 12. During the playoffs, everybody tightens up defensively and goals are hard to come by. This is the model the Kings have been playing all season. It doesn’t necessarily translate to consistent wins over the course of an 82-game schedule, but it’s a winning formula for playoff hockey. In 2011, Tim Thomas proved that when an NHL goalie gets hot, he can carry his team. Jonathan Quick has carried the Kings all season long, but he’s managed to take his game to another level this post season. Quick currently leads all goalies with a record of 7-1, a goals against of 1.62 and a save percentage north of 94 percent. Up front, the Kings have been led by their captain Dustin Brown who leads the team with four goals and nine points in the post-season. It’s hard to imagine that a few short months ago Brown’s name was being tossed around in trade rumours, but you can rest assured he won’t be available this summer. Aside from scoring points, Brown has also set the tone in these playoffs with his physicality. Brown had a memorable hit on Henrik Sedin in game two against Vancouver and he also welcomed Alex Pietrangelo back to the Blues’ lineup with a big hit. On the back-end, after an unimpressive regular season that saw his point totals dip for the second straight year, Drew Doughty has found his form in the post-season. The 22-year-old has five points in eight post-season games and he’s logging 26 minutes a game while controlling the pace of the game with his skating and passing ability. Doughty has also been granted the freedom to play loose and free because Rob Scuderi has been a defensive beast. While it is important to acknowledge the accomplishments of a select few, it’s also important to point out that L.A has dominated the top two seeds in the West without getting anything from Jeff Carter. Personally, I’m not a fan of Carter as I think he’s a turnover machine that is lazy in the defensive zone, but the guy can score. With only one goal so far in the playoffs, Carter has yet to find his scoring touch, but you have to think he will pot a couple at some point. The Kings are one win away from eliminating the St. Louis Blues and if they do, they will have eliminated the top two seeds in the West with relative ease. Looking forward, the Kings are in good shape. L.A would face the winner of Phoenix and Nashville in the conference final and either scenario is a great matchup for the Kings. Both Phoenix and Nashville are defensive teams that limit turnovers and try to pounce on the mistakes of their opponents, so in effect, they play a similar style to L.A. However, as it stands, the Kings are playing that style much more efficiently and effectively than either the Coyotes or the Predators. When you consider how well Jonathan Quick is playing and how well the Kings are managing the puck, the formula for beating L.A is getting pucks deep and beating them with skill. When Daniel Sedin returned to the Canucks’ lineup in game four of the Western quarter finals, the Canucks took the lead in the game and it was clear that L.A was uncomfortable playing from behind. If you score early on L.A, they are eventually forced to abandon their defensive style of play to try to generate some offense. That’s when turnovers and bad defensive pinches get them in trouble. Unfortunately for both Phoenix and Nashville, they don’t have the offensive talent to cause these problems for Los Angeles. An eighth seed hasn’t made the Stanley Cup finals since Edmonton in 2006, but this year the Kings will accomplish that feat.